Here we have Jose Rubio’s follow up to 2016’s “Sensations” album. His first solo album on Fighter Records, and his fourth overall solo album. Instrumental albums can sometimes be difficult to listen to, however, “Forbidden Dreams” grabs the listener by the throat and refuses to let go. Clearly, Jose Rubio (ex-Warcry) has the chops to write metal riffs, however, he also has the ear and talent to play all instruments on the record. Which is very impressive because this is a monster of an album. This album is so much more than shredding as there lies a layer of complexity and grandeur. “Land of Terror” starts with a tremendous power metal vibe that morphs into some beautiful neoclassical inspired metal. Immensely catchy and heavy but never loses that intensity. One of the stand out tracks on the album. Title track “Forbidden Dreams” takes it down a notch and combines sweeping cleans with ultra inspiring leads and methodical solo. It does become slightly repetitive and might have benefited if it was a bit shorter. “Infinity” is one of those songs that you blast when having a bad day. It is very uplifting, incredibly catchy, and inspiring. Definite standout. Now, for those who are suckers for ballads, “Without You” is the perfect tune for you. From the sweeping piano and superior guitar shredding, Jose Rubio whispers sweet nothings into your ear until it reaches the climax…and it becomes clear this is not like other solo guitarist instrumental albums out in the wild. “Mastermind” is a throwback to the 80’s and is a rocking tune! This is a great song to put on and throw back a few cold ones. When Dio said “I speed at night!”, this is just what he meant. “Lionheart” is a slow burn but once it picks up, the guitar hooks grapple the listener into submission. The drum work is frantic and unrelenting. All the meanwhile Rubio does his best to sound grand, inspiring (there’s that word again! ), and heavy. Closing track “No Mercy” is a straight up rocking tune that never gets boring. In your face with catchy riffs, leads, and solo. Great way to close out the album. 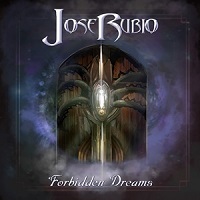 Jose Rubio’s “Forbidden Dreams” is a goliath of an instrumental album that never bores the listener. It has groove and tons of chunky and meaty riffs. At eight tracks, this is also a perfect length for an album. Whip it on next time guests are over and forget about being dj for 34 minutes. My only thought is how much more powerful this album would be with some vocals. Definitely metal soup for the soul. For fans of thrash, neoclassical, and power metal.